After several misses on Michigan whitetails and a phone call to have his brother return his compound, my buddy arrowed his first traditional harvest. Shooting a desert mulie is no easy feat, especially a bedded one to boot. This deer was shot a 25 yards and didn't run another 20 yards. Only a few teeth remained on the lower jaw. Properly the deer's last year of life. I true trophy and a phone call back to his brother to keep the wheeled bow. AWESOME. I would love to just see a mule deer. I hear that they are so much bigger than whitetails. I have to travel across 4 provinces to Alberta before a see one. 3000 miles. A bad day of hunting is still far better than a good day at work. Thats me , my buddy chuck was kind enough to post this for me. 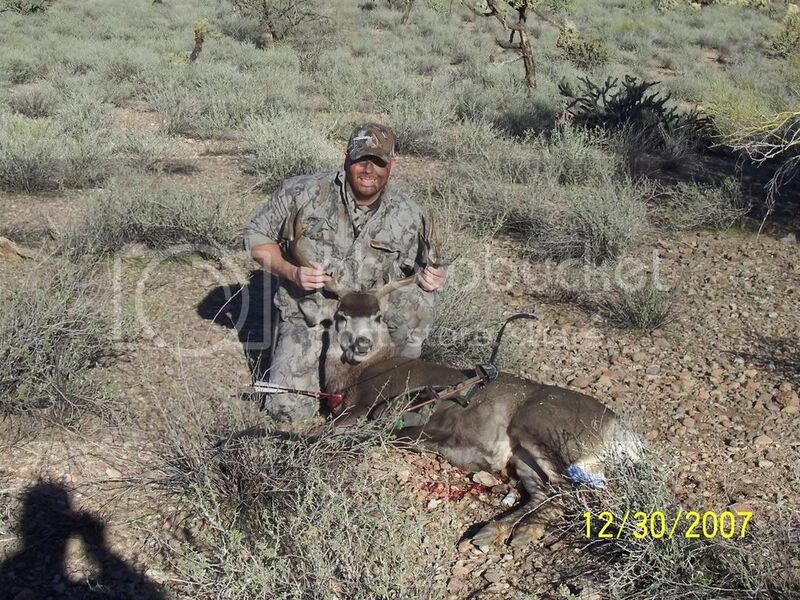 I shot him at about 2:00 in the afternoon beded under a Palo Verde tree in the Arizona desert. What a beautiful buck!!!!! Congratulations! NICE BUCK ! DO YOU NEED A GOOD TAXIDERMIS? Congratulations on a fine stalk and kill. Bowhunting......A way of life and death.